Ibn `Arabi (Abu Bakr Muhammad ibn al-`Arabi al-Hatimi al-Ta’i) (1165-1240) – entitled with the honorifics al-Shaikh al-akbar (“The Greatest Teacher”) and Muhyi al-Din (“The Reviver of Religion”) – was born in Mucia in the Andalusian regional of Southern Spain, in a family of pure Arab blood (hence his name), and educated in Seville. When only twenty he already possessed profound spiritual insights. There is a story of him at this age meeting the great Aristotelian philosopher Averroes, who was shaken by the encounter with such a divine teacher. Until 1198 Ibn `Arabi spent his life in Andalusia and North Africa meeting other Sufis and scholars and occasionally engaging in debates. All this time he had been having various mystical visions. In that year he had a vision ordering him to depart from the East where he would spend the rest of his days. After some years of traveling through Arabia, Egypt, Asia Minor, and elsewhere, and by now a teacher of great renown, in 621 he finally settled in Damascus where he spent the remainder of his life. During this period he completed his magnum opus, the twelve volumes al-Futuhat al-Makkiyah (“Meccan Revelations”), which was not only an extensive encyclopaedia of Sufi beliefs and doctrines, but also a thirty-year diary of his own spiritual experiences; a compendium of the esoteric sciences in Islam which surpasses anything of its kind written before or since. Ibn `Arabi’s output was prodigious. He is reported to have written 289 works, of which some 150 still exist. With Ibn `Arabi we have for the first time a complete exposition of Sufi doctrine; a monumental synthesis encompassing theology, metaphysics, cosmology, psychology, spiritual practice and more. And although earlier Sufi writers discussed metaphysical questions or cosmological doctrines, this was never on the same scale. For the most part the earlier Sufi writings are either practical guides or ecstatic expressions of transcendent or mystical states of consciousness. It was upto Ibn `Arabi then to explicitly formulate what was only implicitly contained in the teachings of earlier Sufi masters. Through him the esoteric dimension of Islam was for the first time expressed openly. One of the most important, perhaps the most important and central, of Ibn Arabi’s ideas was that of the Logos, a term having the double meaning as “eternal wisdom” and “word”. Originally, the term was coined by the Hellenistic Jewish philosopher Philo. Fluctuating between regarding the Logos as the first manifestation of the Godhead and a merely human or universal soul, Philo referred to it as the High Priest, the Intercessor or Paraclete, the Viceregent, the Glory of God, the Shadow of God, the Archetypal Idea, the principle of revelation, the first-born Son of God, the first of the Angels, and so on. Here we have a confusion of mythological-religious, theological, and cosmological themes, many of which were taken up by Christianity. Ibn Arabi shows the definite influence of Philo in his doctrine of the Logos; many of his descriptive terms are identical. But he also brings in Koranic, theological, Sufi, Neoplatonic, and other ideas as well. He refers to the Logos (kalimah) as the Reality of Realities (Haqiqatu’l Haqa’iq) – in contrast to this the Sufi Hallaj used the similiar term “Reality of Reality” (Haqiqatu’l Haqiqah) to refer to God Himself, the Reality of Mohammed, the Spirit of Mohammed, the First Intellect, the Most Mighty Spirit, the Most Exalted Pen (i.e. the Pen which God uses to inscribe the destiny of all things), the Throne (of God), the Perfect Man, the Real Adam, the Origin of the Universe, the Real who is the Instrument of Creation, the Pole (Qutb, on which all Creation revolves), the Intermediary (between God and Creation), the Sphere of Life, the Servant of the All-embracing One, and so on. Here, as with Philo, there is a confusion or hesitation between the emanationist idea of the first manifestation of the Godhead, and the dualistic monotheistic idea of the first created being who, whilst still extremely sublime, is nevertheless separated from God by an undridgable abyss. In other words there is a confusion between the hypostases; in some appelations “the Logos” refers to the supernal Divine, in other appelations to a mere emanation, and not even a very high one (the Viceregent, the Servant, etc), of that Divine. This is the real weakness of any theistic metaphysics; the absoluteness and transcendence of the personal God acts as a distorting straight-jacket that most are unwilling or unable to break. Considering the first of these aspects, the Reality of Realities (Haqiqatu’l Haqa’iq), Ibn Arabi says that this is the the First Intellect, the imamnent Rational Principle in the universe (a Stoic idea), the “Idea of Ideas” (or Archetype of Archetypes – the great Alexandrain Christian theologian Origen likewise referred to the Logos as Idea Ideon. It comprehends all archetypes and existing things absolutely, is neither a whole nor a part, neither does it increase or decrease. It contains the archetypes or realities (haqa’iq) of things, but is in itself homogonous. It is the consciousness of God, the content and substance of divine knowledge. It is the first manifestation or epiphany of God; God as the self-revealing Principle of the universe; God manifesting Himself as universal consciousness. As for the second or mystical aspect, the Reality of Mohammed (al Haqiqatu’l Mohammadiyyah), the Logos is not the actual physical or human Mohammed, but the Reality (haqiqa) behind Mohammed, the active principle of all divine and esoteric Revelation. The Logos as the Reality of Mohammed has the characteristics of being the indwelling revealer of God, the transmitter of all divine knowledge, and the cosmological cause of all creation [pp.74-5]. He is the active principle of divine knowledge. This distinction between the human and the transcendent Mohammed was a popular one in Sufi and esoteric Ismaili thought, by which the Sufis were able to reconcile the historical exoteric religious vehicle of Islam with the esoteric inward experience of the Divine. In Ibn Arabi’s teaching, each prophet is called a logos but not the Logos, which latter term refers to the spiritual principle or Reality of Mohammed. Ibn Arabi calls everything a Logos – a “word” of God – in as much as it participates in the universal principle of reason and Life, but prophets and saints are distinguished because they manifest the activities and perfections of the universal Logos Mohammed to a perfect degree. The difference between the Spirit or Reality of Mohammed and the rest of the prophets and saints is like that between the whole and its parts; he unites in himself what exists in them separately. Finally, regarding the third or individual aspect, the possibility of becoming the Logos exists potentially for all Muslims. The difference between one who is asleep and one who is spiritually awakened, and the different levels attained by the latter, depend on the degree of preparedness. Each Sufi seeks to became the Logos. In the mystical hierarchy, the Qutb or Pole is the Spiritual Head of the hierarchy of Prophets and Saints, the intermediary stage between the Godhead and the phenomenal world, the eternal and the temporal. The Qutb is the “Pole” on which all Creation turns. According to Sufism, the Pole is realised in the Perfect Man, the individual human expres-sion of the Logos. The Divine Logos thus manifests as coutless Avatars, Perfect Masters, Divine Presences, and so on; whether in human form as an actual physical Avatar, or in subtle non-incarnate form as a Presence that moves subtly in the spiritual Heart (Qalb) of each individual being. This is a process that is always continuing, for there is always the Divine Presence in the world, although in some periods it may be more accessable than others – thus the Ismailis speak of Cycles of Epiphany and Cycles of Occultation, and the Kabbalists of God revealing his Face and turning his Face away – but even in the periods of concealing of the Light, there would still be avatars and masters for those who are sincere. At no time are souls stumbling in the world of darkness ever left without guidance or grace. And it could even be said that every spiritual aspirant, through his or her sincere striving for and mystical devotion and surrender to the Divine, becomes a minor Qutb, helping to maintain the worlds through total surrender and selflessness; the sacrifice of the lower self on the altar of the higher self and the Divine above. Ibn Arabi provides a very detailed theory of what could be called “Archetypes”. Nowdays this word, the modern popular meaning of which was formulated by the visionary psychologist C. G. Jung, is given a very vague meaning. It is applied not only to the idea of primordial inherited psychic structures (which would be the “strict” Jungian meaning); but also to the Platonic “Ideas” (which later became, in Christian thought, the “thoughts in the mind of God”); to the Gods of non-monotheistic mythology (Egyptian, Greek, Indian, etc etc); to the angelic hierarchies of esoteric Christianity (Dionysius, Steiner, etc) and other such world-views; and to the Sefirot, the planes or spheres of psychic consciousness, in Hermetic Qabalah; among other things. All these diffeerent realities are simply called “archetypes”. It is as metaphysically sloppy as using the word “God” to indi-cate any supra-physical and supra-personal reality. But as Ibn Arabi points out with his succession of Hadarat, it is not the case that there is a single archetypal reality between the Godhead and the material world, but rather that what we could call archetypes manifest in different form on each of the planes of being between the Absolute and the physical world. The original Essence or Absolute “is void of all qualities and relations, it is the most indetermninate of all indeterminates, the “Thing in itself”. It is indestructable, independent and unchangeable, not a substance, but the One substance.”. The first stage of Creation is described of as the One (Ahadiyyah) or Absolute, which is inconceivable and beyond all attributes, moving towards Oneness (Wahidiyyah) or Absolute possessing characteristics (equivalent perhaps to the Vedantic distinction between nirguna (qualityless) and saguna (possessing qualities) Brahman). For Ibn Arabi, the characteristics of the Absolute are the Divine Names. The a`yan thabita are the “fixed prototypes” or “latent realities of things”. Before coming into being, things in the phenomenal world existed as potentialities in the divine Essence of God; as ideas of His future becoming, the content of His eternal knowledge, which is His knowledge of Himself. As summarised by A. E. Affifi [p.47]: “God revealed Himself to Himself” in His “First Epiphany or Particularisation (al ta`yyun al awwal) in which He saw in Himself and for Himself an infinity of a`yan as determinate “forms” of His own Essence, which reflected and in every detail corresponded to His own eternal ideas of them. Sufis are fond of quoting the Qudsi Hadith verse: “I was a hidden treasure. I desired to be known, so I created the universe ” The Divine conceives of the possibilities contained within Itself, and then brings them forth. Sufism explains the reason from creation not as being due to an imponderable Divine Will, as asserted by exoteric Theism, or a Divine Play (lila) as in Vedanta, but rather simply for Knowledge of the Self. Each possibility is express from the purpose of the Divine coming to know Itself. Before the creation of human beings, the universe existed, but it was like an unpolished, unreflective mirror, in that it was unconscious of the Divine Presence. Man’s purpose is to polish the mirror, so to speak, through attaining a spiritual state of consciousness. The mystic thus becames the mirror whereby the Divine Self perceives Itself. This depends on, the “preparedness” of the mystic; his or her ability to receive and give birth to the descend of one of the Divine Names. The Sufi is thus the instrument whereby the Divine experiences Itself. Being empty of self, the mystic is able to reflect the Divine to the Divine. Being intermediary between the Real and the relative, the a`yan thabita are both active and passive. The Divine Names are active in relation to the a’yan al thabita (the archetypes of the phenomenal world), and these in turn are active in relation to the external world. In each case the higher is active in relation to the lower and passive in relation to the higher. Islamic civilization is clearly logocentric. lbn al-’Arabi places himself squarely in the mainstream of Islam by basing all his teachings upon the Koran and the al-hadith. In this respect he parts company with the philosophers and proponents of Kalãm, who were far more likely to derive their sciences from other sources. Ibn al-’Arabi confirms his own logocentrism by claiming repeatedly that the knowledge gained through opening pertains to the meaning of the Koran. This is a point of fundamental importance, too often forgotten in studies of the Shaykh. The “Meccan Openings,” like the Shaykh al-Akbar’s other works, are nothing if not commentary upon the Holy Book. In order to enter into the universe of Ibu al-’Arabi’s Koranic hermeneutics, one must first cast away all preconceived notions of how a text should be read. In the Shaykh’s view, the Koran is the concrete, linguistic embodiment of Real Being, God Himself. At the same time, the revealed Speech is dominated by the attributes of mercy and guidance — perfectly in keeping with Being Itself, since, according to the famous hadith, “God’s mercy precedes His wrath.” The Divine Speech guides through its “Signs” (ayãt) or verses, just as the cosmos—which is also the Speech of God, articulated within the “Breath of the All— merciful”—gives news of God through its signs, which are the phenomena of nature. The revealed, written Speech can be more readily understood than the revealed, cosmic Speech. It provides the key through which “opening” can take place—the opening of the door to comprehension of the signs within the macrocosm and the microcosm, the universe around us and within us. Ibn al-’Arabi frequently quotes the Koranic verse, “We shall show them Our signs upon the horizons and in themselves, until it is clear to them that He is the Real” (41:53). The revealed Book is the actual, true, authentic embodiment of God’s Speech. Its every letter is full of significance, since the book manifests the divine realities in both its form and meaning. It is true that the same thing can be said about the cosmos, but the written Book has the advantage of having been given a linguistic form that necessarily corresponds with Absolute Truth, which is God. This linguistic mode of existence appeals directly to the distinguishing feature of human beings, the nutq or “rational speech” which makes them “rational animals”’ (hayawân nâtiq). The Book is the barzakh or isthmus between man’s intelligence and God’s knowledge of things as they are in themselves. It provides the God— given and providential means whereby man can come to know things in themselves, without the distortions of egocentrism. If all of lbn al—’Arabi’s works are essentially Koranic hermeneutics, this is because ultimate truth can only be perceived with the help of divine guidance, and divine guidance has taken certain specific forms, “Either houses by their doors,” the Koran commands (2:189). One cannot take God’s house by storm. One enters by the door, when invited. Any attempt to climb through the windows would display blatant discourtesy (sü’ al-adab), an attribute which automatically disqualifies the would-be hermeneut. Because the Book in its actual, revealed form is the embodiment of the divine mercy and guidance, lbn al-’Arabi displays tremendous reverence for the literal text. The linguistic form of the text takes precedence over all else. Certain Western scholars have portrayed Ibn al- ‘Arabi as a great practitioner of esoteric commentary (ta’wil), whereby the literal meaning of the text becomes a window through which one looks into the invisible realm. One can agree with this statement, so long as it is understood that no Muslim commentator has been as concerned as the Shaykh to preserve the Book’s literal sense. 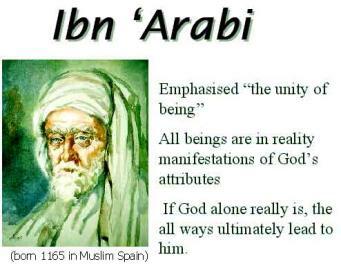 Ibn al-’Arabi never denies the literal and apparent meaning. But he frequently adds to the literal sense an interpretation based upon an opening which transcends the cognitive limitations of most mortals. He often tells us that God may unveil meanings of the text to the gnostic which others have never perceived, and these unveilings can be trusted as long as their do not gainsay or contradict the literal meaning. They are additional interpretations which can add to our understanding of the manner in which the Divine Reality discloses Itself. At the same time, no matter how true they may be, they can never have the slightest effect upon the commands and prohibitions of the revealed Law. lbn al-’Arabi’s basic principle of Koranic interpretation is a simple one, perfectly logical once one accepts that “There is no god but God and Muhammad is His Messenger”: God intends every meaning which a speaker of the language can understand from the literal sense of the text. It is God who created the speakers of the language, brought the language into existence, and revealed the Book. God’s purpose in revelation was clarification, not obfuscation. “God sent no messenger save with the tongue of his people, that [the messenger] might make clear to them” (Koran 14:4). But God had to provide a scripture in the language of the recipients which could guide a whole tradition over history, not simply a few tribesmen of one generation. God spoke in a language which would meet the spiritual needs of all those who encounter the Book. Hence, Ibn al-’Arabi is constantly analyzing the meaning of words as they have been understood by the speakers of the Arabic language to whom the Koran is addressed, though not necessarily as the specialists in various sciences have defined them. The Shaykh treats each word of the Koran and the Hadith with the utmost reverence. No word is accidental. God and His Messenger never speak without saying exactly what they mean. We cannot replace one word with another and say that this is what was really meant. Nor can we interpret the meaning, by “taking the word back” (ta’wiI) to its archetype in the world of divine realities, if that means denying or denigrating the literal sense. It is vitally important to understand the meaning of each individual word and to realize that each expresses in a concrete mode a certain dimension of the Divine Reality not denoted by any other. In the Name of Allah. the Beneficent. the Merciful. According to Ibn ‘Arabi, the Great News actually meant the Resurrection, the Big Resurrection (qiyâmat al-kubra). “Therefore, the Companions of the Holy Prophet”—who knows the meaning this verse—call Ali ibn Abi Talib as ‘the ‘Great News’ since he is the people of haqiqat, and they call him as the ‘Ark of Noah’ since he is the people of shari’ah. Whereas in the realm of Reality, Ali has reached the Comprehesiveness which unknown the differences (al-jam’). In the realm of Shari’ah, Ali has also know and understand clearly the Multiplicity of beings as the manifestation of diversity His Attributes and Names. The Sufis interpret the ‘Big Resurrection’ as the ‘peak’ of spiritual enlightenment that unknown the space and time, rather than as the big occasion which can take place in the future. According al-Qashani, one of the disciples and commentators of Ibn ‘Arabi’s teachings, the Sufis interpret the ‘Big Resurrection’ as the awakening into the Real Life, that is, the Self remains in the Truth (baqa) after experiencing self-mortification (fana) in His Essence. And shall be opened (wafutihat—verse 19) the spirit “heaven” when it return to the body. That is to say, when the spirit returns to the body, the inner and outer sense shall be opened. Likewise, the ‘spirit’ heaven shall be onened. (Abraham) is called khalîl for one reason than that he ‘permeates’, and comprises in himself, all (the qualities) by which the Divine Essence is qualified… just as color ‘permeates’ a colored object in such a way that the accident (i.e., the color) exists in all the parts of the substance. The relation is different from that between a place and an object occupying it. Or rather we should say that (Abraham is called khalîl) because the Absolute ‘permeates’ the existence of the form of Abraham. Affifi, A. E. The Mystical Philosophy of Muhyid Din-Ibnul Arabi. Chittick, William I. The Sufi Path of Knowledge. Corbin, Henry. Cyclical Time and Ismaili Gnosis, pp.80-81. Corbin, Henry. Creative Imagination in the Sufism of Ibn `Arabi (Princeton University Press) p.210. Izutsu, Toshihiko. Sufism and Taoism. Luzzatto, General Principles of the Kabbalah, p.47. Nasr, S.H. Three Muslim Sages, pp.92-98. Parrinder, Avatar and Incarnation, p.204. Paulos Mar Gregorios, The Human Presence, p.76 (Amity House, Amity, New York, 1987). Arabi, Ibn. Isyarat Ilahi: Tafsir Juz Amma Ibn Arabi. This entry was posted in Ibnu Arabi. I like to Ibn ‘Arabian. hosting seo to udzielanie przez dostawcę usługi internetowej zasobów serwerowni. Jeszcze precyzyjniej definiując polega to na “zajęciu” oddaniu do dyspozycji danej pojemności dysku twardego, na której jest dozwolone gromadzić pliki tworzące tekst witryn internetowych i lub użyczenie powierzchni dysku jak miejsca dla plików “leżących” w skrzynce mailowej. Inna wersja hostingu to udzielenie znacznych obrębów dysku, a nawet skończonego serwera względnie kilku – w charakterze fizycznego nośnika dla dużego serwisu internetowego, portalu, grupy dyskusyjnej i innych. W każdej z nich chodzi o udostępnienie fizycznego położenia (dysku lub dysków twardych) dla umieszczenia różnych form informacji osiągalnych przez Net.Dużo usług hosting jest płatnych. Więc dlatego nie chcemy Cię kłamać. Nasze usługi hostingtakże są odpłatne, z jednym wyjątkiem, nasze usługi hosting są jednymi z najmniej kosztownych w globalnej siecie. Proponujemy hosting na najwyższym poziomie, po najniższej możliwej cenie. Przekonaj się sam i przetestuj naszą jakość! Inwitujemy na portal internetowy. Nasze usługi hostingrównież są niedarmowe, z jednym wyjątkiem, nasze usługi hosting są jednymi z najmniej kosztownych w sieci Nie jesteś w stanie w to dowierzyć, czy negujesz jeszcze słuszność tego, co tu jest przedstawione? Jak tak to bezzwłocznie zajrzyjwstąp na naszą stronę internetową i nabierz przekonania o trafności tego tekstu Nasze usługi hosting oferują najbardziej solidną jakość w najmniejszej cenie. Nie będziesz musiał płacić dużych kwot za usługi hosting. Jeśli zajrzysz pierwszy raz na naszą witrynę, pomożemy Ci we wszystkim. W naszym zbiorze ofert znajdziesz wiele korzystnych rabatów dla świeżych gości. Jeżeli zaś jesteś naszym wiernym klientem, bądź pewien, że będziesz miał sposobność skorzystać z niespotykanych nigdzie indziej okazji. Wpadnij niezwłocznie na nasz serwis. Zobacz ile możesz zachować pieniędzy w portfelu z nami. Thanks for writing Ibn Arabi�s Hermeneutics and Criticisism � http://amuli. wordpress.com, I had been looking for anything related and was pleased to come across the tips via this specific content. Along with it eventually being summertime weddings are everywhere you look. I’ve usually been one to get way too excited over weddings, but no harm in that!